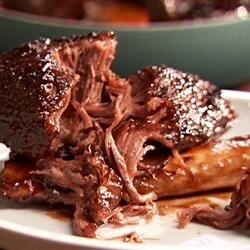 "Beef ribs with a homemade BBQ sauce in a slow cooker (or on top of stove, if you have the time). Very, very good made on High for 4 hours...better on Low for 8. Serve over hot cooked rice." I would definitely sear the ribs first next time and would also leave the water out of the sauce. The flavor was really good, but we prefer a thicker sauce.